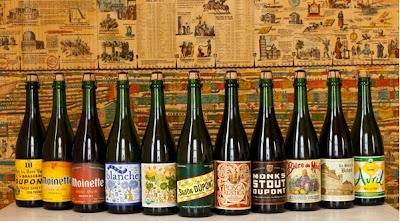 Five course Brasserie Dupont with Special guest Wendy Littlefield from Vanberg & Dewulf and founder of Brewery Ommegang. Wendy Littlefield, along with her husband Don Fienberg, established Vanberg & DeWulf in 1982. In 1996 Wendy opened Brewery Ommegang, the first farm brewery in over in 100 years in the US. The Rimaux-De Ridder farm-brewery was established in 1844 in Tourpes, Belgium. The farm was popularly known as Moinette owing to its having been formerly the property of the Benedictine abbey of Gembloux. In1920 Louis Dupont, an agricultural engineer, was wooed to stay in Belgium by his father who bought him a petite ferme avec brasserie. The farm continues to this day to produce artisanal cheeses and, of course, beers. its entry into the brewery in the person of Olivier Dedeycker, a brewing engineer who took over the brewing operation when his uncle, Marc Rosier, retired in 2002. While Olivier has doubled the output of the brewery over the past decade, he has been careful to preserve the special character of each beer. He’s reached near legendary status among brewers. You won’t meet a more modest man. 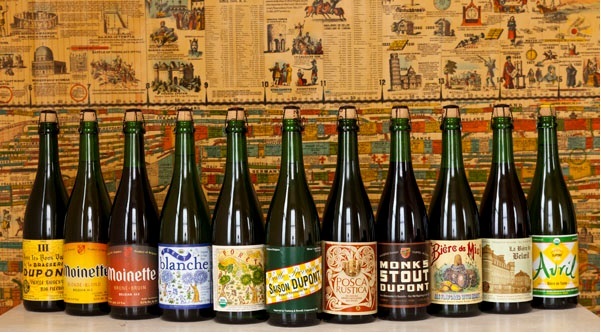 In addition to brewing the iconic Saison, Dupont is a pioneer in the brewing of ORGANIC beers in Belgium. We import four: Avril, Bière de Miel, Foret, and Foret Blanche. The newest entries—Posca Rustica (a Gruit), La Bière de Belœil (a strong Saison), Monk’s Stout, Redor Pils, and Foret Blanche have gotten phenomenal receptions here. The breweries in Tourpes, Pipaix, Dendermonde, Ninove and Gooik are radically different from one to another—reflecting their unique histories and communities, their varied regional brewing traditions and local architecture. Dupont is a farmstead in Hainaut in a sweetly rural setting. Dubuisson is a proud elegant pantile-roofed brewery complex on an ancient Roman road. Slaghmuylder presides like a little commercial fiefdom over the small municipality of Ninove—itself situated on the medieval trade route between Flanders and Brabant in the ancestral grain belt of Belgium. Nearby in East Flanders on the mouth of the River Dender, the Dilewyns Brewery is starkly modern but the emblem on their labels makes reference to Ros Beiard, the heroic horse who saved his masters from capture by Charlemagne. De Cam occupies a barn on the grounds of a museum of folk life in Gooik, “the pearl of Payottenland,” in the heart of Lambic country. It is a setting right out of Breughel. Seeing how different the settings and styles of the breweries are, it is impossible to deny that there is truth to the notion of terroir in beer. The more you know, the better these beers taste. Join us in exploring them all. We started as importers, and became brewers (we created Ommegang). Now, in addition to straight up importing, we’re commissioning beers to be made based on flavors that reflect the special genius of Belgian brewing, and bringing back flavors the market has forgotten. Our focus is to create beers that showcase the unrivalled Belgian talents for unique flavors, fermentation, aging, and ingredients. We work in cooperation with promising Belgian brewers to give them new ways to exercise that talent and to grow with the benefit of our special understanding of the U.S. market. Because Belgium has a tied-house system (80 percent of cafés are controlled by one company) exports are key to the prosperity of the independents. The VANBERG & DEWULF Special Selections we have developed and launched over the last three years are getting plenty of recognition. LAMBRUCHA™ with Lambic from De Troch was named “Experimental Beer of the Year” in the U.S. Open of Beer. Esquire named it “one of the world’s healthiest beers.” Time Out called LAMBRUCHA a “Top 100 Taste of 2011.” HOP RUITER, brewed at the Schelde Brewery to our specifications, took the GOLD medal in U.S. Open of Beer, the World Beer Championships, and swept a major competition in Belgium. HOP RUITER is offered in Belgium, the Netherlands, Japan and the USA. What single malt is to blended whiskey, and chardonnay is to champagne, LAMBICKX is to Gueuze. Dry, almost still, compared to Gueuze, it is redolent of barnyard and Lambic cellar aromas. We act as negociants, buying stocks from casks of our choosing for special blending. We are working with three producers and each resulting beer is utterly distinct. It’s only fitting that with Ghent as our adopted Belgian hometown, we have a beer of that city in our portfolio. GANDAVUM (the Roman name for Ghent) is an extraordinarily dry and herbal blond beer. It is unfiltered, made with all (pilsner & Munich) malt, hopped with Tomahawk and Willamette, and dry-hopped with Willamette.